A COMPREHENSIVE report by Detail Data has raised a string of questions over the work of Northern Ireland’s economic development agency Invest NI, including revealing that from 2011-14 a total of 81% of its funding for local businesses went to the east of Northern Ireland and 19% to the west. Business commentator Paul Gosling looks at some of the lessons revealed by the data. THERE is a long-held perception in Northern Ireland’s North West that it has repeatedly lost out when it comes to investment decisions. Looking through the statistics compiled by The Detail of Invest NI support, it becomes easier to understand why. However, allocating responsibility – or blame – requires more consideration. The figures are stark. While Belfast receives £452.59 of Invest NI support per head, the figure in Northern Ireland’s second city of Derry is less than a quarter of that, at £105.39. This is despite Derry having the worst unemployment rate not just in Northern Ireland, but of the whole of the UK. The support for other parts of the North West is even lower. It is £97.51 per head in Coleraine, £87.00 for Omagh, £57.61 in Strabane and £40.83 for Limavady. Analysis of what this means for Invest NI-supported jobs creation is even worse. In the 2011 to 2014 period, Invest NI supported the ‘promotion’ (ie promise) of a mere 419 jobs in Derry. That compares to more than 2,000 in Belfast. Ok, so Belfast is the capital. But then how come population centres much smaller than Derry also do much better? Some 978 jobs were ‘promoted’ in Antrim, 1,129 in Craigavon and 889 in Newry. But should the North West really be levelling its criticisms against Invest NI? The bitter truth is that Invest NI has not been told to spread investment across Northern Ireland. It has been tasked to boost the economy. It is not part of Invest NI’s remit to promote jobs in Derry (or Strabane, or Omagh, or Limavady) at the expense of Belfast. So it is unfair to blame it for failing to do something that it has not been told to do. Its remit differs from the Republic’s Industrial Development Agency, which has a specific responsibility to spread investment. And Galway and Cork are very pleased with the results. I undertook research a few years ago for a big English city, asking investment decision-makers why they chose one location over another. The answers were consistent: road and rail connections, a local airport with the right flights, good schools and a university that provides relevant skills and research and development. Belfast has all these. But the North West has terrible road connections, a small airport with few destinations, too many pupils leaving without basic skills and a small university campus. Indeed, one of the most illuminating set of statistics compiled by The Detail’s excellent analysis concerns the funding of universities. First, we now know that vast amounts of Invest NI money goes to the two universities. Secondly, we also find out which of Ulster University’s campuses benefits the most – Jordanstown. While Magee campus in Derry was allocated two Invest NI grants, Jordanstown received 40. As a result, Newtownabbey (home to Jordanstown) was the second largest recipient of Invest NI funding. While important questions are raised by The Detail’s report about Invest NI’s funding for the universities and Screen NI, other questions lie firmly with the politicians to answer. Why, for a starter, is Invest NI not expected to specifically promote areas with the highest unemployment? I suggest, though, that there is an historic problem that must now be addressed. Literally for generations, decisions were taken in the past that benefited some parts of Northern Ireland at the expense of others. Locating Ulster University (as it is now called) at Coleraine rather than Derry was one of those. 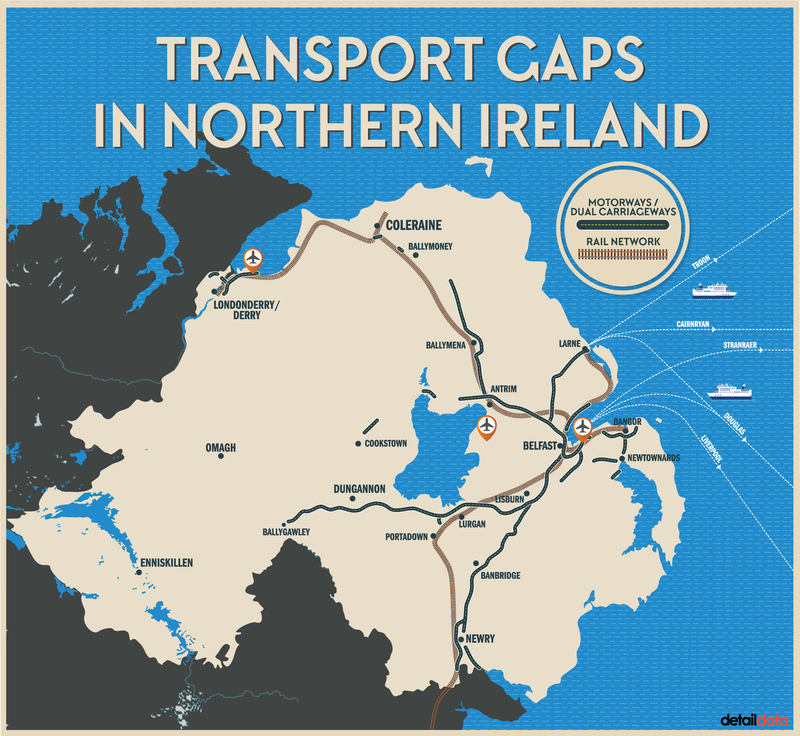 Providing a motorway link to Craigavon and Dungannon, but not to Derry, was another. If today’s politicians really want to increase investment and prosperity in the North West the solution is obvious, though not cheap. They need to provide high quality road links between Derry and both Belfast and Dublin. They need to support the City of Derry Airport with more flight destinations. They need to take stronger intervention measures at weaker schools. And they must expand Magee campus. If they fail to do these things, then the conclusion will be that politicians are not committed to prioritise plans dealing with the high unemployment and poverty in the North West. The special report by Detail Data, which includes scrutiny of the data released by Invest NI plus a comprehensive response from the agency, is available by clicking here.